Posted February 1, 2016 & filed under Blog. Tapes, loggers and transducers all require an open well and an expert on site. They are expensive to buy and use. So they aren’t used often enough or close enough to a location of interest to matter. Wellntel’s focus is to deliver the most information to the most people, regardless of budget and expertise. To do this, we created an affordable, accurate, continuous, and permanent groundwater and well water level monitoring system. 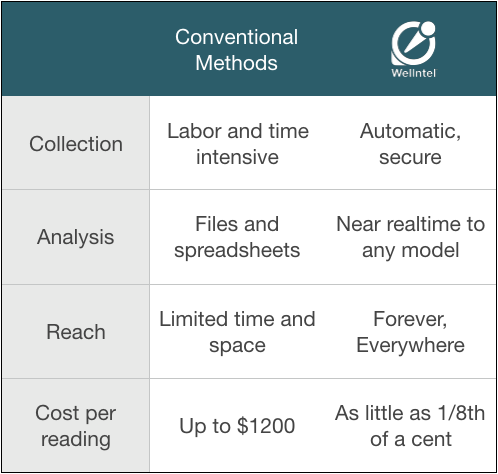 It’s a whole new ballgame in terms of collection, analysis, reach, and cost per reading. Gathered over 1.25 million groundwater measurements in 15 states. Informed new local groundwater agreements. Confirmed connections between extreme rainfall and groundwater recharge. Helped communities grapple with intense pumping or deep drought. Identified dozens of leaky pipes and tanks and helped owners save money with preventive maintenance. Warned homeowners, farmers and servicers of failing pumps and wells before it’s too late. The Wellntel innovation is sparking a #groundwaterinformationrevolution (go ahead, tweet it!) Americans are becoming intensly groundwater aware. What was once mystical is now factual. Moreover, groundwater professionals are benefitting largely. By supporting the development of local Wellntel networks, scientists and engineers can pinpoint problems before they become emergencies. They can amass ground truth an unmatched resolution. And they can finally find correlations and interdependencies in the water cycle that were invisible before. To learn more about the #groundwaterinformationrevolution, register to attend a Webinar featuring case examples and an under-the-hood look at this groundbreaking development.